A few months ago I got to visit the set of Pirates of the Caribbean: On Stranger Tides while the production was filming at Pinewood Studios outside London. While there, I was able to participate in roundtable interviews with a lot of the cast, as well as screenwriter Terry Rossio. As one of the creators of the Pirates of the Caribbean movie franchise, along with his writing partner Ted Elliott, Rossio has been writing Captain Jack Sparrow since the first film, so it was very cool to hear his thoughts on how the movies have been going and the challenges of making the 4th film great. Before going any further, if you haven’t seen the great trailer for Pirates of the Caribbean: On Stranger Tides, I’d watch that first. As most of you already know, the new Pirates movie is about the search for the Fountain of Youth and it stars Depp, Cruz, Ian McShane, Geoffrey Rush, Kevin R. McNally, Astrid Berges-Frisbey, and Sam Claffin. Like I said during my set visit video blog (watch it here), I think the filmmakers behind the Pirates franchise have taken everything that worked about the first three movies and and that’s the backbone of the 4th movie. Instead of too many characters and side plots, we’re following Jack Sparrow as he searches for the Fountain of Youth. Of course new characters are brought in to expand the Pirates universe, but On Stranger Tides is going to be a straight forward action adventure that should be easy to follow, and it’s loaded with huge action and it was filmed in 3D. While I was let down by the 3rd Pirates movie, everything I learned on set makes me think On Stranger Tides should be a great film. Here’s what Rossio said on set in October. For the audio, click here. Pirates of the Caribbean: On Stranger Tides gets released May 20, 2011. Question: How much do you pay attention to the online sites? How often are you reading them? So you’re saying you read some of the sites? Rossio: Yes I do. I have threatened to do a pool to see when the actual screenplay is going to leak. Which I’m surprised it hasn’t leaked yet. The other thing I do is I keep track of the various fansites, because you know you have a core base of fans and I’m just really interested in what they have to say, what their hopes are and what they are looking forward to seeing as far as they do know the story. Does that ever influence, influence the direction that you and (word?) that you might take and if you ever think, oh that’s a great idea, I think we should. Rossio: All through, the four movies now, you know maybe that hasn’t been completely clear, but the trilogy really was a fan-based effort. Like we wrote it for our fans, I mean we wrote it the style that we thought that fans would enjoy. They want a really immersive story, they want a complex story, they want more character stuff. They want their most beloved characters to all have important moments, and that’s what led us to, in the trilogy, doing the sort of tapestry, interwoven, multiple redundant stories because the fans were just really eating it up and really enjoying it. Everyone is talking about what a great script this is. Everyone is really excited, how long did it take you guys to write this one, compared to writing the first story, in terms of time you guys wrote? Rossio: You know there are more similarities than differences; in every scenario there’s been a time pressure. The first script was written in three months, and then went into filming just a couple months after that. It’s the nature of how these come together that there’s a game of chicken that goes on in terms of pulling the trigger as to making the film, when you’re going to make it, how much time you have. So it’s been, I suppose we have a little bit more this time than we did in the course of doing the two sequels because of how those were filmed at the same time. But gosh, I mean it just took about a year to write, you know? Did you have the release date before you started writing, were you writing it and then as it was sort of being turned in, everyone is getting excited and then all of a sudden, the release date happens? Here’s what we need to have a draft? Rossio: It’s funny yeah because they never actually give you the green light, it’s just, at some point, you just figure, “Wow, I guess we built stages and there’s scripts being built.” I guess it’s a good thing, you know (laughs). You think that there’s some big clear moment, you know a bell rings or something, but it’s kind of, you walk out of the elevator, you’re walking down the hallway, and the executive says something like you’re approved to go on a location scout. And then you go, “I guess we’re making it.” (interviewer laughs) You know it’s real, it’s real subtle, it can be real subtle when it actually happens. Can you talk about how you built the script? Rossio: Yeah well, we are very lucky in that we have an iconography, if that’s the right word, of what may take place within the story world that we’re constructed. We’re in the world of ghosts stories, and stories of the sea, and elements that are associated with pirates. Sort of gothic elements, historical elements, romantic elements, etc. And within that world, there are certain things that we get excited about defining what they are. Like for example the flying Dutchman, Davy Jones, Davy Jones’ Locker, those sorts of things are in the public consciousness but maybe not quite clearly defined. 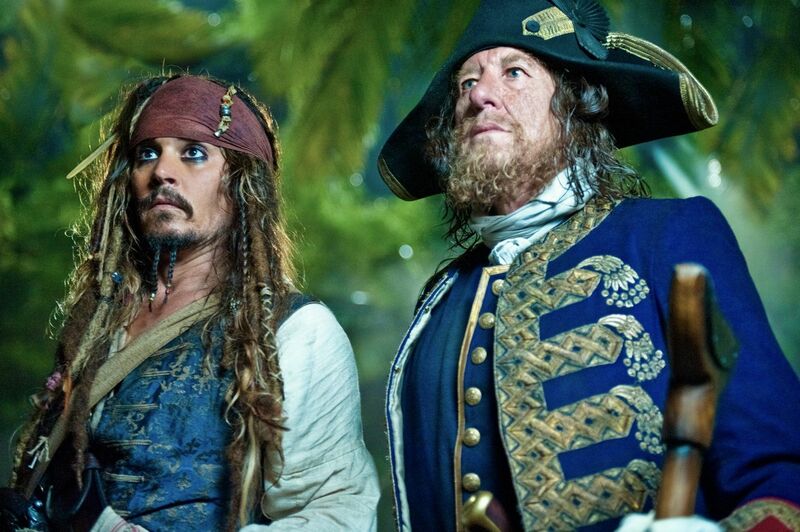 So as we go through the different—when you have an opportunity to then actually do another Pirates of the Caribbean film, you can’t help but say, “Well let’s see, mermaids. We’ve mentioned them but we haven’t really explored them.” The Fountain of Youth, that’s something people know about but what’s, what is it really? Black Beard, Queen Anne’s Revenge is his ship, those are elements that sort of scream out because they’re, they’re iconic, somewhat well known, but yet undefined. So then we start by building out from those omens. Things like Execution Dog in London is a famous place, zombies, and the whole voodoo religion of the Caribbean, that’s an interesting thing. So those go up on the board, and then you start to actually say, “Well, we have the point of view of the characters that we have, or from the point of view of Jack Sparrow, what haven’t we put him through yet, what haven’t we explored, what hasn’t he done emotionally?” And then even stylistically in terms of the film, what haven’t we done as a film yet in terms of—because we have such a mix of the horror elements or the ghost elements, the supernatural elements, the romantic elements, etc. When you’re working on number four, do you get ideas of where you think to yourself, well we can’t wedge it out in there, but I’m going to tuck that in my back pocket for number five? Or number six? Rossio: Up in the office, there’s a whole board of ideas that are exactly that, yes. A whole board worth. And that’s again, we were lucky because we have the sea bearing story, whether that’s, you know look at the maps. There’s a sea serpent over here, there’s a giant spider over there, there’s New Orleans up there. You start to think about, those are just intriguing. And if they don’t turn into this one, then they go on the boards, just in case. It seems through what we’ve seen in the last day or so, there are a lot more realistic elements being brought in from the real world into this one. Black Beard obviously, the Queen Anne’s Revenge, the production designed them the same, there’s a clear date of 1750 because that’s where you obviously got Execution Doc. Is there just shifting time between this and the previous films? Rossio: Yeah, I would say so. One thing that is consistent is the need for reinvention. Certainly I know that Gore (Verbinski, director of the first three films) felt that way. The second film he didn’t want to have to be like the first, and the third shouldn’t be like the second. And then we all can’t help but come into the fourth and say that. Well you want to certainly continue what’s worked before, but you can’t help but say, “Wait a second, in this epicenter, so to speak, in this installment, what are some things that we haven’t done that fit within the world?” And bringing in some reading on some more actual historical references, we’ve done it before, but maybe not quite so much. So you turn up the dial on that a little bit. And also, it’s whether or not it works in the story. In this case, there’s elements to support the story and what it’s telling. Can you talk a bit about your writing process? You know obviously there have been varying times that you’ve had to work on the different stories, but how much is devoted to breaking the story versus actually writing? And then your part of the team, is one of you the pacer, and one of you the typer? Or do you do different versions and send it to people back and forth, somebody stronger in dialogue and somebody more on the story? How do you guys work together? Rossio: Let’s see, painful. (laughs) Sporadic. Painful. How do you explain the writing process? Actually, what I will go to with that question is, one of the things that was very unique about this—I shouldn’t put it that way, unique is the wrong word. There’s something that happened before that happened more in this screenplay than in others and that was Johnny Depp’s involvement. We had more early meetings with Johnny in terms of talking about what he was interested in doing, and then when we presented story elements, or presented plot elements. He was really involved. He was surprisingly—surprising is not the right word—he was more involved, or significantly involved in coming up with story lines, connecting characters, creating moments that we would then fashion, shape and then go back. And and pitch that again. So that was different. In terms of usual process, it’s ideas on boards, it’s a lot of discussion, it’s very collaborative, not only with the writing partnership. But with (Mike) Stenson and Chad Omen, our executive producers and Jerry Bruckheimer, who will also come in, gosh it’s hard to characterize, such a mish mash of things. Because also Rob Marshall, when he steps in the screenplay goes through whole other iterations, then when the actors come in, we have a talk with actors, and then we do a whole other set of revisions as well. So it’s tough to characterize it certainly. Rossio: Hollywood screenwriters are a frustrated, usually bitter group of people because we often get held to a position of responsibility amongst you folk that we don’t in fact have (laughs). So actually there are so many techniques, we have to really determine, “Okay what are your parameters?” and do the best work you can within those parameters. You have to choose your battles and argue for the positions that you really believe in. You have to be willing to lose a few words in order to win the overall battle. Sometimes you have to just beg and say, “Look this will work this way, if you’d just try it.” Even when it comes to like right now shooting over on the stage. There’s discussion about, should a certain line be in or out? And if it’s in and you love it and you want to hear it, and you win that argument and they film it, you feel good. If the decision is made, “it doesn’t work, we don’t have time, we have to do it a different way,” then you feel like maybe you lost a battle. Here’s the thing though: I personally would be frightened if it was only my opinion that was putting these things together. I wouldn’t want that, you don’t get anywhere unless you make use of the collective talent that’s assembled around you, and you have to be open to it, even when it conflicts with your own point of view. Because I have been proven wrong so many times when I thought it was perfect, “leave it alone,” somebody says, “no.” They go a different direction and it got better. So after a while you learn to fight, but you also learn to kind of concede. With all that might, I’m really interested in your assessment now of the first three stories, and then with this script. It gave you a chance to readdress things that you felt hadn’t gone the way you wanted or just a chance to reboot, or you know just take things in, maybe not difference or similarities. But just how you felt the first three stories went and this one gave you a chance to do something that hadn’t been done or you wanted to do more of? Rossio: Well yeah the first three stories were, as I said, designed to be a trilogy, so as a trilogy, we had an ensemble cast of characters, and some might say an ever-growing ensemble of that, cast of of characters. And so we found ourselves weaving this complex tapestry to service this really pretty kind of vast trilogy story. The fans loved it, I think some of the critics felt like they didn’t want to have to necessarily invest so much into the complexity that we were going for. Certainly with this story, since we’re no longer necessarily creating that big of a tale. I think of it as kind of a James Bond sort of thing, like [with] James Bond you can do a single story. It’s complete in and of itself, and that opens you up to things like unity and more set-ups and payoffs that are perhaps more clean and clear. It is a very very different sort of thing to just set out and say, “Okay we’ve just got one story here with a particular set of characters” as opposed to the world creating primary and secondary and thirdenary (sic) (laughs) characters that we were sustaining when we were putting together that trilogy. When, during the first films and second films and the third film, there’s a whole show business legend about how Happy Days was supposed to be about the Cunningham’s. People loved Fonzi so much, you had to wedge him into every scene. And you know Han Solo steals Star Wars films. Were you prepared to how the zeitgeist was going to respond to Captain Jack Sparrow and did you rewrite the character to fit the later films to take advantage of how much people really found him to be a stand out of the ensemble? Rossio: To the first part of your question, yes, when we were making the first Pirates film, we thought we were making the last Pirate film for the next 50 years because that’s what happened to pirate films. Some good people. Rossio: Yeah, Cutthroat Island. What would happen if we wrote Pulaski’s Pirates, or you know whatever? Some group of people just lucky enough to make a pirate movie, somebody is crazy enough to put money behind it, and then you know doesn’t happen again for another several decades. So we were going into it with all the strikes against us: it was based on a ride which hadn’t worked, it was a pirate film which hadn’t worked. You know Disney features at that point had never had a $200 million grossing film, prior to Pirates. So even it being a Disney movie was a little bit, maybe a strike against it, certainly in the live-action field. Even the Jerry Bruckheimer brand at that point was not really for family movies by any means. And so it was very much not expected. We were trying for that target, we were trying to make Raiders of the Lost Ark meets the Richard Luster Three Musketeer movies. That was our goal and we all thought, okay good goals. But you know what are the odds? And certainly specifically with the Jack Sparrow character. Who knew that it would—you know we’d worked on Shrek for example, and it’s exciting to say, well there’s “Ogre” but what do you think of when you think of “Ogre?” Well now you kind of think of Shrek when you hear the word “Ogre.” Now we have a good “pirate” and we used to think, mostly I’d think Long John Silver, but now I think Captain Sparrow is definitely up there. That was definitely a surprise. Now having said that, for the trilogy, the answer to the second part of your questions is no. The trilogy stars, as a protagonist, as did the first movie, Keira Knightley as Elizabeth. She’s the protagonist through all three films, she and the Will Turner character, Orlando (Bloom). Those are our leads so to speak. The Jack Sparrow character is the Han Solo character to some degree. And I think of the quote that Neil Gaiman had when he was writing The Sandman, the graphic novels. You know he said everybody always wants more death, everybody loves death, death is, it’s fantastic. Death is a wonderful character, but death works because she floats in and out of the story and of course, later on he did a film featuring that. But still, the way that that character is intrinsically designed is to exist in a world that supports that character interacting with that. And so as popular as Jack became, we were very concerned to make sure that he still functioned the way that he could function, which isn’t necessarily the driving narrative force of the story. Even if he takes over the story in his own way. People always talk about Keith Richards being the template, but is Jack Sparrow a little bit of a Dean Martin character too, that kind of breezy drunken charm? Rossio: There’s a little bit of everything in Jack Sparrow, I can’t say no to that. To me, in terms of the design of the character, the key to Jack Sparrow is that he’s the trickster, he is an archetypal character, in that he is a trickster, just that type of character doesn’t show up in American cinema that much. You go to Bugs Bunny to get the classic kind of tricksters, and the key to the trickster character, is that that character is environmentally based. 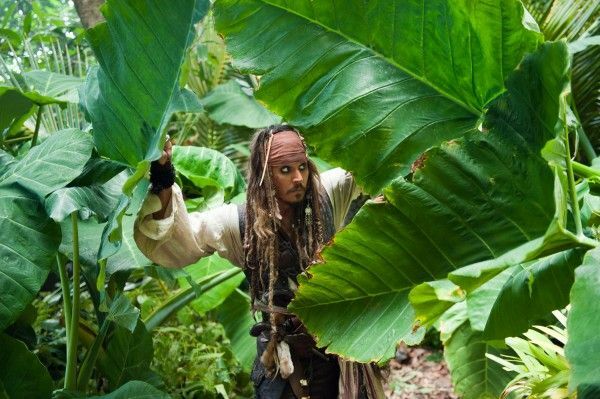 Jack Sparrow is not that good at not getting caught for example, (laughs) you can catch him. He’s caught all the time, the thing is that you can’t hang on to him because what he does is, he starts tap dancing, and he starts blowing smoke and he starts talking circles around you. And what he’s doing is, he’s looking for the opportunity because the ultimate thing about Jack Sparrow is he has faith and conviction in himself that the world is going to turn his way eventually. Maybe not now, maybe now he’s down and out, maybe his ship is sinking, maybe he’s drunk, maybe he’s in prison whatever. But he knows, he has faith through long experience that if he just hangs on long enough, there’ll be a little bit of fate that will turn things his way that he can actually use to his advantage, and then move on with his life. And that’s what he does. You mentioned the James Bond connection where this sort of a one-off film, but obviously Disney, Jerry Bruckheimer, I mean it’s a very valuable franchise to the studio. Are you planting any seeds or sort of thinking as you did this one, about possible future stuff with or without Jack? Rossio: It’s a really interesting question, I hope you don’t mind somewhat of a complex answer. The first part of it is that the audience is going to decide whether we do another one. And we won’t know that until this one comes out. Ultimately, it’s audiences who will vote and decide, the studio may or may not want another one. We’ll find out, I mean right now they probably do, but we’ll find out based on this movie. But in terms of prepping for that moment, I’ll go with a quote by J.R.R. Tolkien. Tolkien, in designing the Lord of the Rings universe, the Middle Earth world, had this idea of distant mountains, and in the backdrop of the story he was telling, he would always invent these distant mountains. And of course the readers would write in and say, “Oh that scene’s cool, tell us more about…” whatever these embellishments that were backdrops to his world. And he said, “Well I can’t do that. If I go there to tell you about those stories, then I have to invent more distant mountains to the distant mountains because those serve to make the world that we’re in realistic, because there’s always stuff about our world that we don’t quite know about. But if those elements are there, then the story works that you’re telling.” So what we did is, we make sure to have those distant mountain bits in there. And it could be a prop, it could be a reference, it could be a character. It could be a description of a place, it could be just a throw away line. Now sometimes we know where that might lead, sometimes we don’t. But if it gets to another movie, we’re going to be very glad that we had some loose threads, loose ends, and sort of random references that might hint at something to come which we may pick on them. Or we might not. The first film had a lot of influences from the ride, and I’ve talked to a couple people and they say that this film has some throwbacks, and I didn’t know in the writing process, do you try to incorporate anything from the ride? Rossio: Absolutely. Yeah in fact the way that works, which has worked on all the movies—It’s funny because we don’t really learn our lesson. We write our story, we’re working on our story, we’re immersed in the story, and we get stuck and we start to think, “Okay now what do you do when you’re stuck?” Well you do research. (laughs) Or you go for a walk, you work through it. And then all of a sudden we think, “Wait a second, we have another resource here!” And I can’t tell you how often what we have done is, when we’re stuck, go back to the ride, look at it, see what’s available there, see what it might inspire and then we come up with a story solution. And that happened on this film as well. Can you tell us what that is? Rossio: Can I give that away? I don’t think I should give that away (looks to publicist) Susan says “no” (laughs).